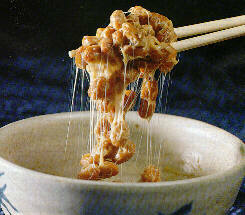 I love Japanese food and even love Natto – fermented soy beans. When my son was little, he hated it when I ordered it; his comment was always it stinks and how can you eat that stuff? Natto is definitely an acquired taste, but for me it makes a satisfying meal for dinner. Tuna from Granada Market – it isn’t cheap but it is first rate quality. The trick to cutting the tuna is to follow the lines of sinew and remove that part. This is a trick I learned from Masa at Ginza Sushi Ko. This wasn’t the best Natto as it was not whole soy beans – do not buy the pieces. Natto ready to be mixed. Basically you stir the Natto until it is slimy. I mix the natto with an egg yoke, some wasabi, soy sauce and then add the tuna. No picture of the finished dish, but it was good.